Driving west and then south after leaving Djerba, the scenery continued to change gradually and we were in the desert. The south east of the country is hamada, or stony desert. Not knowing quite what to expect of the hamada, we thought there would be more of the emptiness that we’d experienced since heading south from Sfax. The rugged beauty of the landscapes south of Medinine and into the mountains west of Tatouine are truly stunning. Adrian has already written in a separate post about some of the accommodation we’ve been lucky enough to stay in, which also made this part of the trip such a treat. A common theme of our trip during the last nine months has been our many visits to ruins of human settlements dating from ancient times to relatively recent remains. Villages destroyed by war, areas abandoned because of migration, unsustainability or natural disaster, from the ancient pre-Christian citanias of Portugal, Roman Pompeii and Herculaneum, all the Roman and Punic sites we’ve seen here in Tunisia to Oradour-sur-Glane in France, a tragedy of the Second World War, and L’Aquila‘s recent earthquake damage. They all have their stories to tell. 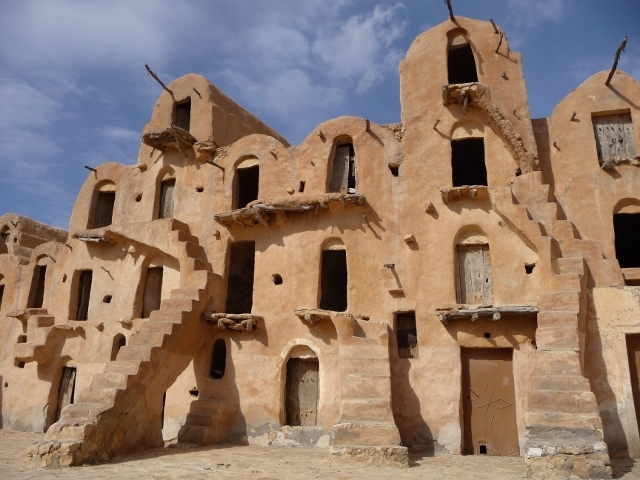 In southern Tunisia we’ve been captivated by the ancient, now mostly abandoned or in the process of abandonment, Berber troglodyte villages and Ksour (ancient communal, often fortified, grain stores and meeting places for the nomadic community – singular is ‘ksar’). Villages so part of their particular mountainside it’s hard to make them out at all from a distance. Usually it’s their white painted mosque that stands out from the terracotta landscape. Once formidable, they have been abandoned largely due to the promise of better conditions and houses with more space built on the plains nearby, although these seemed to us rather bland and somewhat soulless compared to what has been left behind. It’s not just a change of housing though, but a whole way of life that is on the brink of disappearing forever, but who can argue with the desire for electricity and running water? At the village of Metameur just west of Medinine, we stopped at our first partly ruined ksar to a warm welcome from the lady guardian. We found that although the guest accommodation was no longer open, we could camp there. It was very cold, but magical to be able to sleep surrounded by such a wonderful building, and silent except for the call to prayer from the mosque next door. During the afternoon we had a walk around the village and had chatted to a few people we met along the way. One of them was a slightly down at heel chap who showed us a couple of local houses of note, such as a derelict house that had belonged to a Jewish family, and invited us to come to his house later for some tea. I was sure I’d smelled alcohol on his breath, but discounted this as impossible in a dry country. We didn’t really feel like going to see him, but I felt that it would be rude not to. So after we’d eaten, we walked down to where he said he lived. His wife and daughter, we assumed they were, answered our knock but didn’t understand any French. We understood that he was sleeping so we tried to say not to worry we’d see him another time. The daughter ran to another house and we were to follow. In a bare room, our friend was indeed asleep, and the girl was trying her best to wake him up. From the way he could barely talk or walk, and the general air of neglect, there was no doubt. He was absolutely off his face. We made our excuses as best we could and left, our eyes opened to the fact that alcoholism does exist in Islamic countries. The next morning we took to the hills, looking back across the plains to the sea from the top of the ridge. 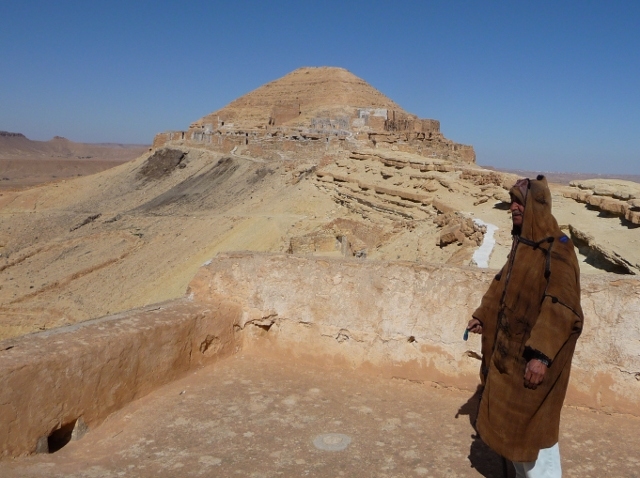 Our first stop was Ksar Jouamaa perched high on a crag. 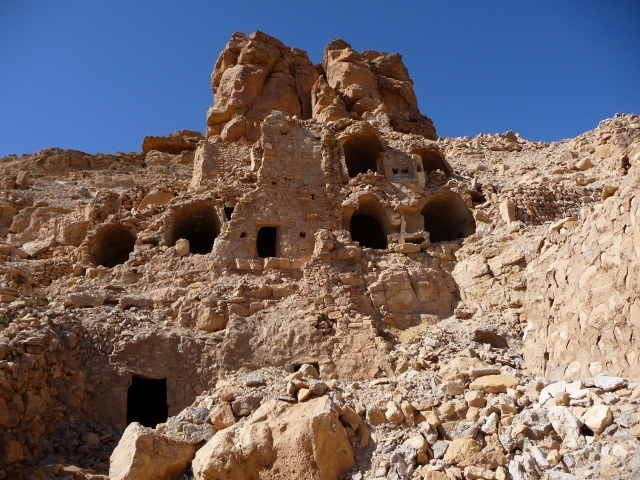 We ended up staying the night here in one of the ghorfas (individual storage rooms of the ksar). When we first arrived there though, there was another campervan, Slovenian registered, parked up outside. We stopped to say hello to them and were immediately invited for lunch. It was great to spend time with Dian, Karmen and their son Martin, and swap travellers’ tales. They were taking some time out from their tourism-related business in Slovenia in the low season. Independent travellers are thin on the ground in Tunisia so it was a welcome interlude. 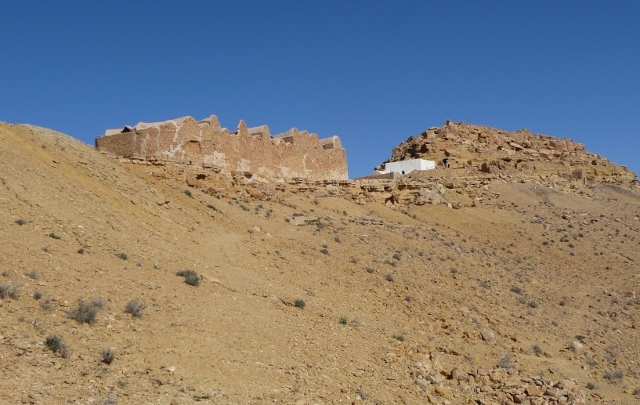 After our chilly but beautiful night at Ksar Jouamaa, we headed south, visiting another Ksar – Ksar Hallouf a short detour off our route. It was different in feel to the other two, sitting on a hill above an oasis, and completely disused. We were ‘guided’ around this one, whether we wanted or not, for a small tip of course, and saw the old olive press and a precarious mosque that looked as if it was about to fall down at any minute … we didn’t linger inside. Douiret makes an immediate impression as you can see it for miles as you approach. It was blowing a gale as we climbed the outside steps of the troglodyte residence up to our room. The space stretched deep into the mountain and was wonderfully cosy. The huge benefit of living in a home dug into a mountainside is that the temperature is constant so it is warm in the winter and cool in the summer. We ate dinner in our van, and when we emerged to go up to our cave room, we were starstruck – we had forgotten how wonderful the stars are in the desert. With no windows it was so dark when we awoke, it was hard to believe a beautiful sunny morning awaited us outside. The light was magical and I ran out to the outer terrace with its magnificent view over the mountains and the desert all around. This was one of those special places that make the soul sing. It had been cold overnight though, there was a thin layer of frost on the van roof. After breakfast we wandered following the line of the village at its lowest level. Apart from a couple of guest residences, Douiret is abandoned. The new village, built in the 60s, nestles discreetly in a fold in the plain, while Douiret Ancien gently crumbles. Dating from the 13th century, it was quite a big village that stretched a way along the hillside as well as upwards and we walked most of the length of it before finding a winding route up the mountainside until we were on a plateau above. Another path lead us to the precarious pinnacle of the village, that hadn’t looked possible to get to from below. In Britain it would have been fenced off as a hard hats only area, so fragile did some of the buildings look. It was joyous to wander at will without the trappings of tourism and to picture the village as it must once have been, not that long ago. Douiret is that bit further away from the tourist day trips from Djerba that it has escaped the detrimental effects of tourism that have negatively affected the nearby village of Chenini. Chenini is still partly inhabited, very much on the tourist trail and the inhabitants of the old and new towns are out for the main chance, our van was literally stopped several times by would-be guides. Although we recognise that people are just trying to make a bit of money in a poor country, they foist their attentions on you and then expect a tip way in excess of what could possibly be any local going rate. We stopped at a marabout shrine on a small hillock nearby, but in spite of our protestations of not needing or wanting a guide and not having the money to pay one anyway, a young man was so persistent that we ended up running back to the van! This repeated harassment tactic put us off from visiting the village itself, not as impressive as the other less visited villages anyway! 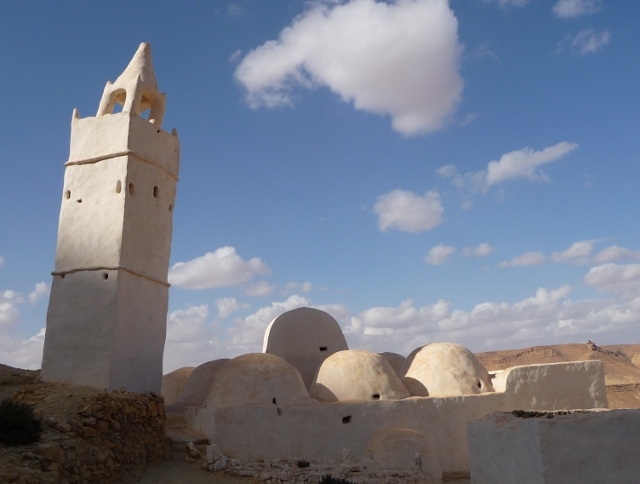 We did get to the wonderfully whimsical looking mosque Jemaa Kedima, once part of an older long gone village close by. Its leaning minaret, like a candle left too long in the sun, presides over the tombs of a holy man and of the seven sleepers. The legend goes that there were seven Christians imprisoned here by the Romans. When their bodies were discovered centuries later, they awoke having meanwhile grown several metres, only dying again when they converted to Islam. Their long tombs are in the cemetery. Here the visit was rewarding and hassle free, the guardians more than happy with a couple of coins in their tips plate. Luckily Chenini was an exception and we didn’t experience any such trouble at other villages in the region. Guermessa, is another silent lost troglodyte village like Douiret. Our guide book, printed in 2008, said that families were gradually moving to the new town below and the old village would be abandoned within a decade. Well, it has been completely abandoned now, within four years. We were the only people there, save for an old man in a threadbare burnouse (a traditional cloaklike garment), who ushered us in to keep warm for a moment by his charcoal fire in an alcove underneath the mosque, before leading us off cackling gently and rather disconcertingly. Afraid of yet more enforced guidage, we followed him. 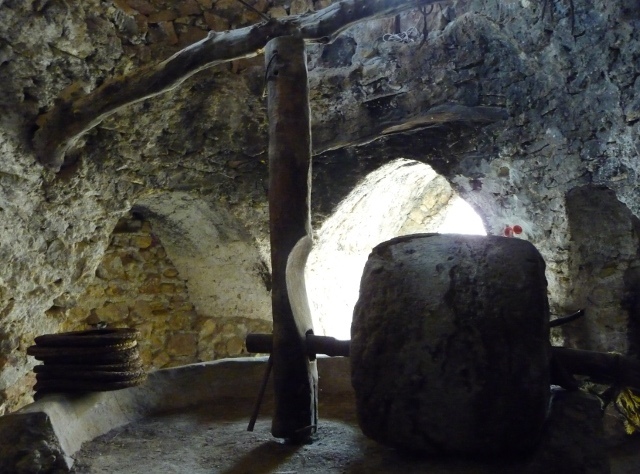 He showed us where the old olive press was and a couple of other old buildings we wouldn’t have seen otherwise and then left us alone. The village spiralled round two hills and we walked upwards towards the main ruins. Houses are in a very bad condition here, and obvious rock falls from the crags above must have hastened their abandonment. On the other hillside the ruins have been ‘tidied’ with cement on the edges of all the walls to prevent further decay. We saw this being done at Beni Barka, a hill top village, where the work force was tidying the walls and cementing in quite a slap dash manner. However, the hard work they were doing was saving the buildings from deteriorating further. It seems that there is more awareness of the historical and cultural importance of maintaining what’s there now – arresting the decay. Also their value in attracting visitors isn’t yet being tapped into, but there is that fine balance between sensitive tourism and preservation and turning it all into a theme park. 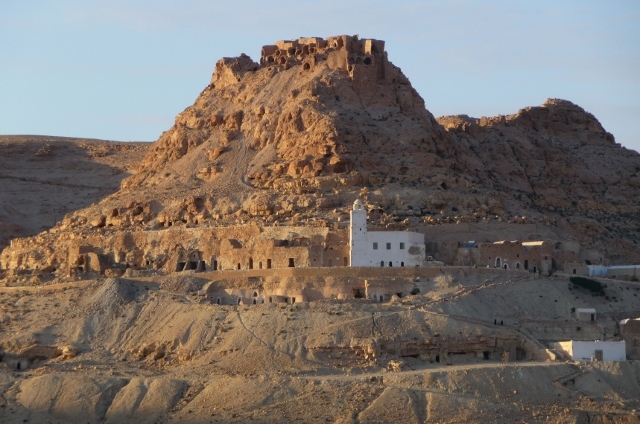 The visit to Beni Barka, was part of a loop south of Tatouine, which also encompassed many ksour in various states of preservation, usage, or almost just rubble. 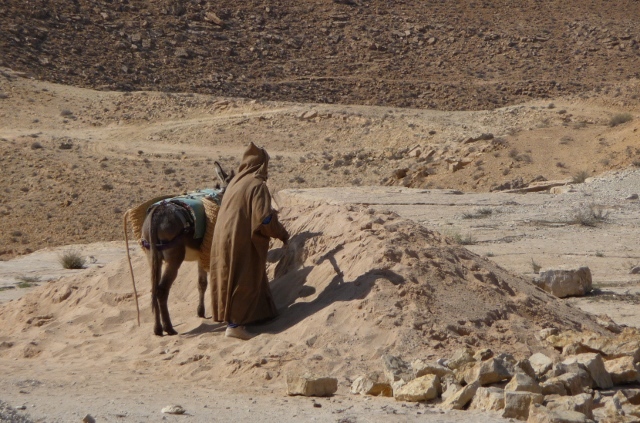 They were perched on rocky ridges, or in the middle of villages, like Ksar Ouled Soltane, still acting as meeting places for villagers and nomadic peoples. Some were really easy to spot and visit, some were locked, some we found after several kilometres of piste driving (ie non surfaced desert tracks ‘motorable with care’, our guidebook said). Some dated from the 9th century, some from the 19th. Some we gave up on finding. 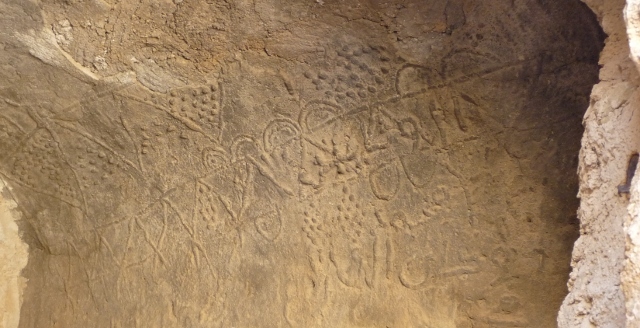 In many you can still see images and symbols made by the families – hand prints, small circles indicating rain, quotes from the Koran and so on. The ksour fell into disuse when security improved under French rule and there was less need for fortified storage. Villagers were encouraged to have their own stores by their fields. 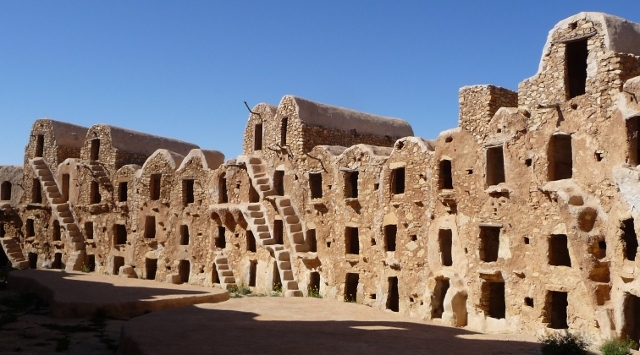 These old ksar compounds hold a charming fascination for us. 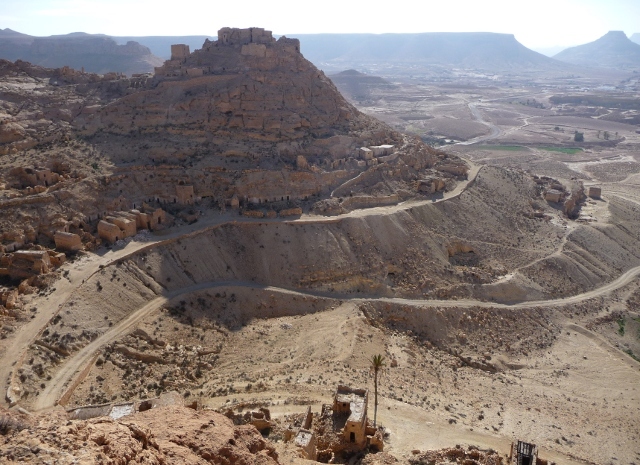 Some of them blend in so well you can’t tell if it’s a ksar or just the continuation of the rocky hill top, like one of our favourites, which we found west of Tatouine – Ksar Mourabtine. We walked all the way up to it, given tea by a couple of workmen on the way, and it was well worth the climb with wondrous views. It was very pretty inside too, partially preserved with cement, with four storeys of ghorfas reached by precarious steps. Next to it there were abandoned rock dwellings. We stayed in the area a few days, based at our mountain hideaway at Douiret and were sad to leave. We didn’t have a clue as to the existence of these remarkable places before coming to Tunisia and yet they are some of the most impressive both visually and culturally that we have seen on the entire trip, and to be able to wander round most of them unhindered by guides or usually any other people has been a real joy. This is as far south as we will go in Tunisia, there isn’t anything to see beyond here. It’s oil related industry and military zones to the southern tip of the country. South of Ksar Ouled Soltane we’d seen the flat nothingness stretching into the infinity of the hazy horizon. We retraced our trail northwards, passing Ksar Jouamaa and spending another night at our Ksar at Metameur on the way, luckily without spotting our drunken friend. In spite of all the ksour we’d visited, Metameur was still as lovely as we’d remembered. This entry was posted in Art & Culture stuff, By Country - Tunisia, Personal stuff, Travel stuff. Bookmark the permalink. V cool. Not sure if you got my message recently – can’t find it on the blog and I had not placed it towards the front – new to this – but wanted to know if this is Ellie Garraway that I met in Austria in 1984 and who came out to Australia for a year or so? It is Jenny Gardner here. Hi, Jenny – yes, right EllieGee! She’s sent you a quick email, and will write more to you soon.